The other day, a fellow blogger, mentioning her distaste for Manoj Kumar’s films said that while she has “nothing against the man himself”, she really hates his films. I know what she meant (at least I think I do): I hate that insufferably xenophobic “all that is Indian is good, all that is Western is bad” philosophy espoused by films like Upkaar or, even worse, Purab aur Pachhim. But I tend to shove that lot of films to the boundaries of my recollection of Manoj Kumar’s films. For me, his best films are the outright entertainers, the romances and suspense thrillers he worked in. Especially the suspense thrillers: Woh Kaun Thi?, Anita, Gumnaam—and this one. 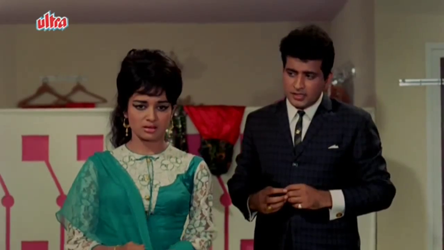 Manoj Kumar puts in an appearance somewhat late in Saajan; it begins with the heroine, Rajni (Asha Parekh), who is one of the chorus girls at Modern Theatres. Rajni’s in dire straits; she and her widowed mother Laajwanti ‘Laajo’ (Sulochana Latkar) are somehow managing to scrape together two sort-of-square meals a day by Laajo’s cottage industry production of paapads [literally paapad belna, this. I’m sure if she’d put her mind to it, she could’ve found something less strenuous to do, like stitching clothes]. Considering Mommy’s in bad health—and coughing her guts out—I don’t think this is a good idea. Especially not for those who’ll be consuming those paapads. Rajni’s career seems to be stuck in a groove [and a non-paying one at that] because the theatre’s manager Tarakkilal (Janakidas) hasn’t paid the girls in many months. Things have reached the stage where Rajni’s mentor and guru (Gajanan Jagirdar) has paid Rajni and her mother’s rent on their behalf. When Rajni protests, guruji tries to comfort and encourage her. In the meantime, a chance incident has had unexpected consequences. One day, late for work and unable to catch a bus, Rajni hitches a ride in a long, expensive car being driven by a chauffeur (Om Prakash). The driver, who’s called Balam, is inclined to tell Rajni to go take a walk, but finally relents and drops her off at Modern Theatres. 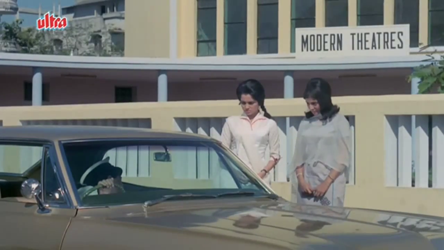 …where the gossipy Auntie (Shammi) who sits at the desk outside notices whose car Rajni has arrived in. It’s the car of Ashok, the very wealthy son of the city’s wealthiest crorepati, Jwala Prasad Saxena. Auntie immediately jumps to the conclusion that Rajni is in love with Ashok [and, obviously, since she’s gallivanting about in his car, he with her]. Rajni, because she’s late for the rehearsal, is ticked off—and, when she snaps back at him, fired—by Tarakkilal. Leaving the theatre with her loyal friend Bela (Shabnam), Rajni again runs into Balam, in Ashok’s car. Balam is returning from an errand for Ashok, and seeing his pesky new acquaintance [along with her pretty friend, whom Balam falls for], he offers them a lift. …the result being that Auntie, gawping madly, is now firmly convinced that her initial surmise was true: Ashok and Rajni are an item. She scurries in to break the news to Tarakkilal, and he realises that this could be put to good use. Ashok Saxena is a city bigwig; Tarakkilal is deep in debt. If news spreads that Ashok is in love with Rajni, people will flock to the theatre to see Rajni. The theatre will be a success, and hopefully Ashok too will be persuaded to shower some of his wealth on his sweetheart’s workplace. So Rajni is called back to the theatre, fawned over, reinstated, made the leading lady—all to her puzzlement. It’s Bela who discovers from Auntie the reason behind all of this sudden benevolence [buttering up, more like it] and tells Rajni. Rajni isn’t keen on perpetrating this illusion, but Bela reassures her. There can be no harm in it, can there? And Ashok Saxena won’t even come to know. These girls have no clue how far Tarakkilal will go for tarakki. Before long, he’s spilled the beans to a reporter, who publishes an article about the Ashok-Rajni jodi in a newspaper…and Ashok (Manoj Kumar) sees it. And is livid. Ashok, to be fair, has his share of troubles. [Well, he doesn’t have to roll paapads for a living, but still]. One such bother is the nasty Seth Dharamdas (Madan Puri), who has been pestering Ashok for a loan of Rs 2.5 lakhs. Ashok’s refusal—not just his own, but also that of the board of directors of the company—has annoyed Dharamdas, who’s vowed to get even. 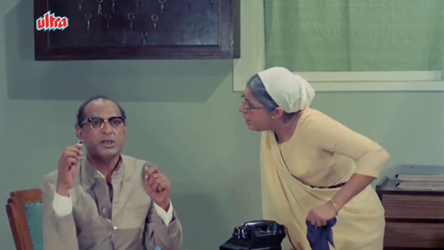 The other irritant is the clingy Sudha (Lata Bose), whose father (Brahm Bhardwaj) is Ashok’s father’s bosom pal. The two buddies [as best friends in Hindi cinema are wont to do] have decided that Ashok and Sudha must get married, but Ashok is averse to the notion. He tries to avoid Sudha, but she’s tenacious as a limpet and has about as much brain power as one, too. Now, having read this newspaper article, Ashok sees red and storms off to Modern Theatres to confront Rajni. 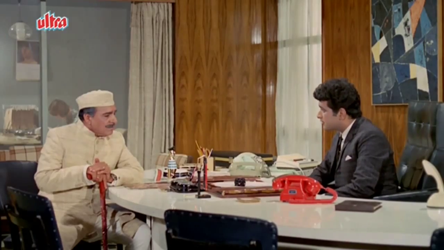 Rajni, waiting for Vinod, a reporter who’s supposed to interview her, mistakes Ashok for Vinod. And Ashok, after a good deal of bewilderment at this girl’s brazen rigmarole about their alleged romance, actually does fall in love with her [despite her very questionable dress sense]. Things start getting complicated now. The many seths to whom Tarakkilal owes money are breathing down his neck. He thinks a tea party—at which Ashok will be the guest of honour, invited by Rajni—will fit the bill. It will impress the seths, and will get Tarakkilal the mileage he needs. Rajni, caught in a cleft, confides in ‘Vinod’ and it’s he who comes up with a solution: his friends, he says, have often said he looks like Ashok Saxena. He can pose as Ashok Saxena. Nobody will be any the wiser. But, truth will out. Vinod is finally revealed to be who he is, and confesses his feelings for Rajni—who, after a little huffiness [and a song, always a good way of manaao-ing people] is happy to say yes to his proposal of marriage. 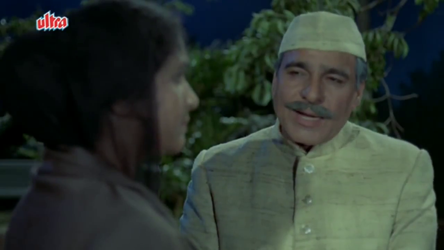 Ashok’s father Jwala Prasad Saxena (DK Sapru), in an inexplicable [but welcome, since it cuts out needless melodrama and angst] about-turn, forgets Sudha and her father, and bestows his blessings on the Rajni-Ashok match. It is at this happy juncture that Seth Dharamdas pops up again, bad penny that he is. He’s read in the newspapers about Rajni and Ashok, and figures that one way to try his luck again with Ashok is through Rajni. 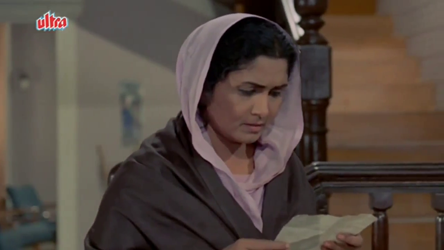 He gets her address from the Auntie at Modern Theatres, and goes to Rajni’s house—only to see who Rajni’s mother is. He doesn’t meet her, but sends her a note, requesting a rendezvous in a deserted park one evening. Laajo goes, and panics when she sees Dharamdas. “Sheroo!” she squeaks, and one cannot help but think this man did a good thing by changing his name to Dharamdas—it certainly makes him sound less like someone’s pet dog. (c) Therefore, Laajo’s husband has been in prison for the past 15 years, and still has 5 years to go. He’s not dead, as Rajni has been lead to believe. Dharamdas reminds Laajo that if Jwala Prasad Saxena comes to know of this grimy secret—that his beloved son is going to marry a jailbird’s daughter—the wedding will be called off in a jiffy. But, since this is a secret and known only to the two of them (Dharamdas and Laajo), he will be kind and keep his mouth shut—for the small sum of 2.5 lakhs. [One admirable trait in this goon: consistency. That was the exact amount he wanted from Ashok]. 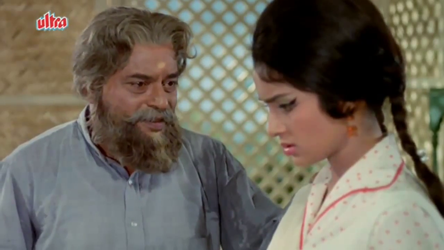 When Laajo protests that she cannot possibly get hold of such a huge amount, he reminds her that Rajni can—by asking Ashok. Constant reminders from Dharamdas over the next few days finally push Laajo into acquiescing. And, since she tries to portray her demand from Rajni as a sort of repayment of all that she’s sacrificed for Rajni all these years, Rajni is terribly disappointed and annoyed with Mum. She tells off Laajo, and then—unwilling to dump her sweetheart with such a mercenary mother-in-law—goes and breaks off her engagement, leaving Ashok very puzzled indeed. …and, the next morning, Seth Dharamdas’s servant finds his master dead, shot through the heart. 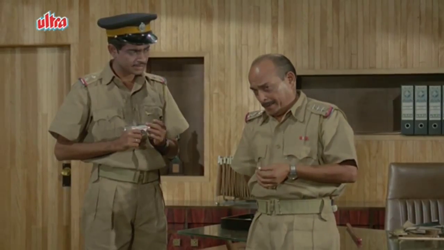 The investigating officers, Inspector Khan (Raj Mehra) and his assistant, Tiwari (a very young and slightly gawky Shatrughan Sinha) find plenty of clues: a chalky footprint, lipstick marks on a brandy snifter; a pistol; a letter; a large brass button; a crossed-out appointment written on a notepad. 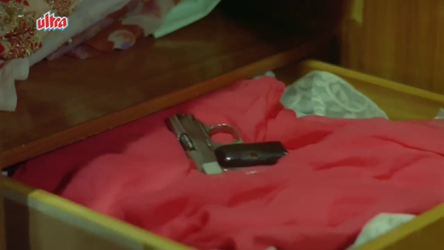 It doesn’t them long to trace the license number of the pistol that’s been found—and it leads to Rajni, who confesses to the crime. No, not exactly. Because what follows is something like a twist to the Rashomon effect, with three different people giving their own versions of how each of them killed Dharamdas, and why. And, there seems to be irrefutable proof in support of each of these three claims. The only problem is, Dharamdas couldn’t have been killed thrice. So who killed him, really? The total paisa vasool-ness of it all. This is a good entertainer, what with the romance and humour in the first half, and the mystery in the second. The mystery is the best part of the film—it is rather puzzling, and I personally think this is one of the those few Hindi films from the 60s that actually takes the trouble to make sure the details are etched in well. The cast is very good (it almost reads like a who’s who of Hindi film character actors during the 60s: Murad and Iftekhar are among the other prominent names here, who appear later in the film). And, while the songs (by Laxmikant Pyarelal) aren’t exactly my favourites, some of them—especially the title song, Saajan saajan pukaaroon galiyon mein and Resham ki dori—are nice. And, the resolution of the mystery comes about in a way that is too pat, too convenient. I wish there’d been some more cerebral work done here by the cops—as it is, they come off looking rather incompetent. Also, one aspect of the explanation reflects rather poorly on one particular individual, and nobody seems to mind. This looks FABULOUS. Added to the list immediately. Do, do. It’s a very good entertainer. Low on melodrama, high on romance, suspense and a little comedy. i have seen many people disliking manoj kumar . i liked him most in pathar k sanam in which he played the character with ease.i don’t like his dailouge delivery in roti kapda aur mkaan. if we overlook that he played a character of a frustrated unemployed man. i don’t like his dialogue delivery in movies of 70s. i think he has kind of urdu hindi accent. he was fab in mera naam joker. was looking very handsome in western attire and loved his chemistry with simi garewal. mera naam joker first part has been written by him and his dailouges of character david. i loved his dialogue of solah baras ka modd. its my observation if you see last scenes of his movies i meant ending scenes woh kaun thi,neel kamal, poonam ki raat, anita. you feel he is a good actor. in last scenes there are no dialogues only expressions and some back round music. i feel he is totally in character. you can see just d last scenes of movies i mentioned . i think he was more of a writer and director. my fav shot of him is n upkaar lake’s shot in which he and aasha parekh are sitting near lake and there is a sun reflection on it. and when saira banu gets disappear in dark corridors of oxford herself wearing black in koi jab tumhara hriday todd dey. and best song shooted by him ek pyaar ka nagma ahi. beautiful mirror shots. i love his many dialogues , screen plays. his best screen play was undoubtedly mera naam joker first part. people have different take on his patriotic avtaar. but i remember an old radio show on which simi garewal said for him that he writes good scenes and dialogues . he loves his country very much. everybody loves but he makes movies on patriotism which is totally different thing. it was a fun movie and amitabh bacchan gave screen test for it. i think he would have done a far better job but would have looked so young . i liked its suspense part n get lost in nostalgia that gone are d days in which cases used to be solved without mobiles. i like this movie for aasha parekh. manoj kumar and aasha ji developed differences while shooting upkaar but again differences were solved while working on this movie. i read somewhere. I have a feeling I’ve seen Pasand Apni Apni, but I’m not sure. :-( This is one trope, though, which I’ve come across in other films too. I remember, there’s a Farooque Sheikh movie called Yahan Wahan which has a similar premise. That’s also basically just a romance, in which the heroine (who’s an interior decorator hired to redo a wealthy young man’s new flat) meets the young man – unaware of who he is – and tries to impress him by passing off the flat as her own. A very good movie, and lots of fun. In case of Saajan and Pasand Apni Apni, it was exactly the same, Rati pretending to be Mithun’s girlfriend and Mithun like Manoj Kumar pretending to be an ordinary man. 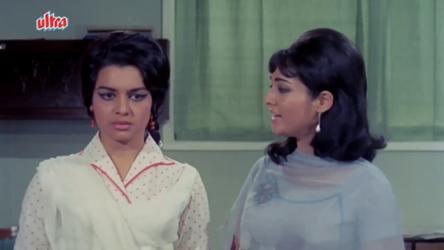 Rati like Asha Parekh asking him to pretend to be the rich man completely unaware of the fact that he is the one. Mithun like Manoj Kumar pretending to bribe the waiters at the restaurant so that they recognize him, in short it was more or less an exact copy of Saajan only it does not move into the suspense territory. I just remembered. I have seen this film! Well Saajan definitely came before Pasand Apni Apni, from where did Saajan get its inspiration? I wonder. Possibly some Hollywood film? I wonder. Also Gajni, the Aamir Khan movie of a few years ago. I realize now that it had pretty much lifted this romance and implanted it into the first half of the movie. Yup, AK (from the blog ‘Songs of Yore’) mentions Ghajini too. I’d completely forgotten that angle of Ghajini, but when AK mentioned it, I remembered. Seems to be rather like that ‘rich man arrives at his summer villa to discover that his manager has changed it into a hotel and is reaping the benefits’ plot, which began (?) with Come September and was reused in both Mere Sanam and Kashmir ki Kali. 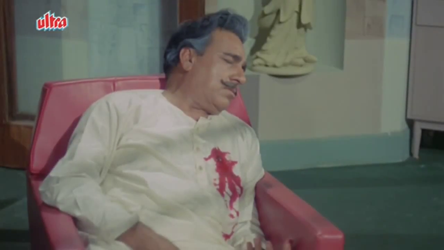 That Come September plot was also used in another favourite of mine – Ek Bar Kaho. This plot was first used in the hollywood film-happy go lovely (1951). The same story has been used in Indian cinema as far as I know in the following 5 films (there may be more films like this though)- 1) Kashtipathor (1964)-Bengali film. 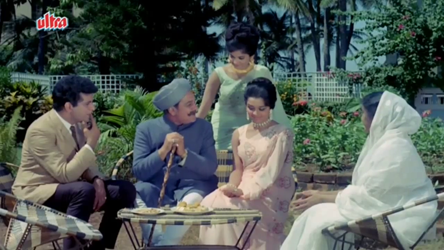 2) Saajan (1969). 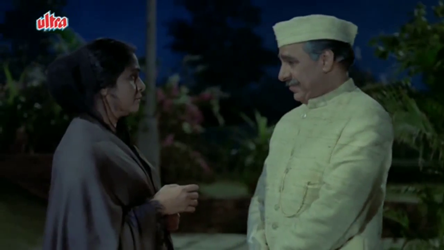 3) Pasand Apni Apni (1983). 4) Ghajini-both its Tamil and Hindi versions. Hadn’t heard of Happy Go Lovely! Thank you, Raunak. Will look out for that. I remember watching this film on DD, when it was shown between the Wimbledon men’s finals. I think it was raining there and when it rained there, DD showed Saajan in bits and pieces, making it more of a mystery. But all said and done it was great fun. One never knew when the film started and the tennis match ended. Saajan in Wimbledon it was! Our 60s heroines though born of poor parents and no food to eat, had always some money left for a good coiffeur! For once, this wasn’t a film I watched on DD! :-D I watched this for the first time a few years ago. On TV, I think, but one of the other, non-DD channels. I liked it so much, I decided I had to get hold of the DVD too. Yes you and Harvey are absolutely right about the attire of our “poor”, heroes and heroines. Another thing, the rich fathers were always attired in a suit and if they happened to be relaxing then they always wore an expensive dressing gown. What’s more the rich in Hindi film unlike most Indians always use the knife, fork and spoon. I don’t see them doing that in real life. I always found all this quite funny. Yes, I wonder why the rich fathers seemed to always wear expensive dressing gowns at home – I’d have thought it would’ve been too hot for that in most of India, no? And one never sees any ACs even in those grand filmi mansions. Only fans, and that too often not. I suppose the eating with knife-and-fork thing is really dependent upon one’s background. My grandmother (nani) was very particular about that, and made sure that her family didn’t just eat with knife and fork, but knew which knife and fork went with which course – so my cousins (who grew up in Calcutta, under her tutelage) knew their fish knives from their steak knives really early! Yes I understand but in Hindi films the rich people are generally not from that kind of a background, at least they are rich but the usual rich Indians eating Indian food. Very true. Not just the fact that these rich onscreen Indians seem to be eating Indian food (which you just can’t manage effectively with knife and fork! ), but also the fact that they generally don’t appear to be of the sort of background that would eat with knife and fork. Offhand, the only credible filmi families I would imagine actually eating with a knife and fork would be Veena’s family in Kaagaz ke Phool, or Nargis and her father in Chori-Chori. With nearly everybody else, it just seems so out of place. and ” Resham ki dori” which are my favorites. Fortunately, even though he was making films like Shaheed, Upkaar and Purab aur Pachhim, he didn’t stop doing these romantic and/or suspense films on the side for other producers/directors. For instance, both Upkaar and Anita (also Patthar ke Sanam) were released in 1967, and both Shaheed and Gumnaam were released in 1965.
he took the route of hai preet jhaa ki reet sdaa. i love shammi in this movie maximum. she steals the show here. she was in upkar and purab aur paschim. but I ove here. class apart. I don’t understand sawan ki ghata. i think do badan, pathar k sanam and sawan ki ghata had a common villan pran. In sawan ki ghata sharmila looks gorgeous. i find her in better make up and attire in this than in aradhna. Yes, she does look lovely in Saawan ki Ghata. It’s been a long time since I watched that movie, but I remember her being very chic. if we compare do badan , pathar k sanam and sawaan ki ghata. common hero and common villain. only do badan gets registered in my mind due to aasha manoj chemistry. scenes have been written well too. they have happy scenes in first half only. they get separate. in pathar k sanam its comedy + romantic and having two heroines dilutes the feeling of pure romance .In sawaan ki ghata, side characters have more scenes than lead. wonder to categorized this film in which genre ?? do badan although forced tragedy remains with me due to first half and the painful ending showing true love. I agree. I tend to remember Do Badan better, probably because it’s also somewhat different from the usual Hindi film. Not just in that it ends in tragedy, but also because the way the villain actually changes for the better over time – he does end up repenting for what he’s done. do badan is i think an overlooked fllm first half is pretty fine. simi who plays third angle, her presence is graceful. the purity of love is felt even if heroine is married off and there is another girl for hero.when they both die everybody feels finally both got united. its a beautiful tragedy. aasha has carried this movie on her able shoulders. and shammi , joy , shashi , sunil any of them would have been fine in it. the role dosent demand much energy so giving a second thought, shammi would have been wasted here. hero heroine discussed separation from beginning that they will be separated. giving an idea to the audience to get ready for it. rightly labelled as tragedy . I am happy that sajan ‘s villan is not pran saheb but madan puri. Oh I loved this film. All that romance and suspense was just too good. I love that song – Sajan sajan. Lol at infected papad. Better to cough over a sewing machine than papad. Better to kapde see see than papad bel bel. There are so many poor women who work much harder to bring up their children, but our filmi maa has to be on the brink of death. Excellent review. My summary: 90% Ghazini, 10% 1960s. You must do a post on Asha Bhonsle’s “naughty” songs like “Main raat bhar na soyee re baimaan baalma” from the movie “Ab kya hoga” with the suggestive lyrics “Ghoda pakad ke royee, & Danda pakad ke royee re” ! And her cabaret numbers like “Main ik haseena woh ik diwaana” from “Aaya sawan jhoom ke”, “Sharma na yoon ghabra na yoon” from “Joshila” & the lovely “Baharon ka hai mela” from “Yaadgaar” , “Aaj raat hai jawan” (“Bhai Bhai”) ,& the song you’ve mentioned in one of your posts “Pyaare aaja chori gori gori baahon mein”. There aren’t enough of those songs in each of the categories you’ve suggested… so I’ll pass this one up, thanks. Here’s a link to the “Ab kya hoga song, picturised on Bindu it’s hilarious but well done . I guess so. I’m more inclined to do the cabaret songs post, though – there are still many more of those that I like a lot, when compared to the naughty songs. Manoj KUmar was perhaps the mosted opted for hero for mystery/suspense films. All were enjoyable including this one. I’m feeling very subdued while writing, because just read about Pran’s passing away. I wonder what it was that made Manoj Kumar so popular a hero for mystery and suspense films (and I haven’t even mentioned Poonam ki Raat yet, mainly because I thought it was rather meh). He may have actually enjoyed doing them – I know he helped a lot in other aspects of Woh Kaun Thi?, including the designing of the posters. Whatever. These are mostly a very entertaining bunch of films. I must review some more. I heard about Pran’s passing away only at about midnight last night. RIP, Pran. He was a class apart. Coming late to the party, Madhu, and you made me grin with your asides. What was with filmi maas and coughing and hacking their way to death? I mean, couldn’t they be poor and not cough? Leela Chitnis was always suffering from tuberculosis (that poor woman must be the longest suffering maa in the history of filmdom! ), and Sulochana Latkar and Nirupa Roy ran her close in the stakes. I remember watching this on DD in the 80s. Like you, I found the murder more engrossing than the romance (which, in my opinion, was rather tepid between the two), and the resolution rather abrupt and somewhat less-than-satisfying. But yes, paisa vasool even if I am not a Manoj Kumar fan! Heh. Leela Chitnis somehow totally fitted the suffering maa role, she looked so frail and pathetic! Oh, and Achla Sachdev managed it pretty well too, especially in films like Waqt. while remembering director mohan sehgal aasha ji said saajan was such an unusual murder mystery everyone was a murder suspect. i love it for shammi my favourite roles of hers, aasha in it and due to murder mystery. sajan was coming on classic today. one day mera saya was coming in morning and on other at night. i want to appreciate madan puri ji who enacted dying scene 4 times. 3 times for what ashok rajni and balam were saying and last actual death. 4 baar maut. i really appreciate chaar baar marna. also with rajni the scene was of making advances too. me and my mother was seeing shatrughan sinha so thin. he belongs to well do family of Bihar. but still looked liked khana pina kum hai. i want to salute mohan sehgal ji that lighting of the movie is so bright so clear unlike few movies of 60s. i hate sapru due to sahib biwi gulaam. manjhley thakur but here was a likeable figure. and i noticed a thing the investigation happens in dhram das flat and not police station but where the police is sitting it does look like station. Check on Subscene. That’s the only site I can think of that might have downloadable subs. Or check Induna, they may have a DVD with subtitles.